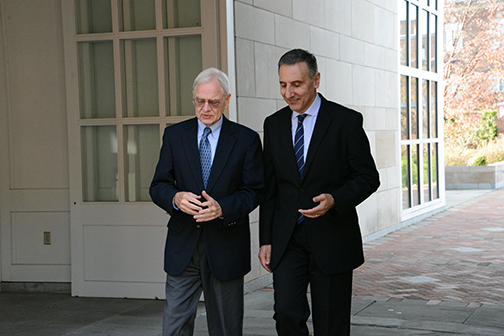 Though he doesn’t officially start as dean of the Penn State College of Engineering until Jan. 13, Amr Elnashai made a quick trip to campus today to attend a few meetings and chat with alumni leaders and college officials. Elnashai met with the board of the Leonhard Center for the Advancement of Engineering Education and the College of Engineering Advancement Committee. Elnashai is currently head of civil and environmental engineering at the University of Illinois at Urbana-Champaign. He holds the Bill and Elaine Hall Endowed Professorship and serves as director of hybrid simulation at the National Science Foundation’s Network for Earthquake Engineering Simulations laboratory, which investigates infrastructure design and construction to minimize damage from earthquakes. 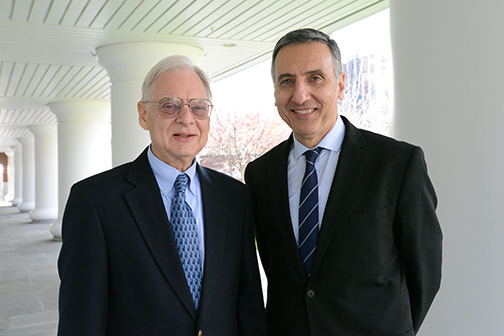 Wormley leaves Penn State after a distinguished 21-year tenure as a researcher, professor and Harold and Inge Marcus Dean of the College of Engineering. More on Elnashai’s appointment to Penn State can be found at: http://news.psu.edu/story/292383/2013/10/23/academics/elnashai-named-new-dean-college-engineering. 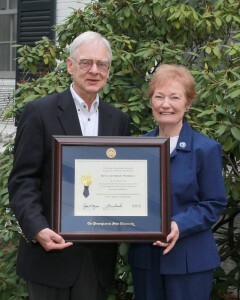 More on Wormley’s retirement can be found at: http://news.psu.edu/story/142471/2013/02/01/engineering-dean-wormley-retire. The search for the next dean of the Penn State College of Engineering has been narrowed to two candidates. Both candidates will be visiting campus over the next few weeks, engaging in small group meetings and open forums with engineering faculty and staff. At the forums, the candidates will make brief presentations, followed by an open question-and-answer period. The first candidate open forum is scheduled for 3:45 to 4:45 p.m. on Sep. 5 in 117 John Bill Freeman Auditorium in the HUB-Robeson Center. The second candidate is scheduled for 3:30 to 4:30 p.m. on Sep. 16 at the same location. Information on the candidates will be announced by the search committee in the near future. After Dean David Wormley announced his retirement in February, a search committee was convened for the next leader of the College of Engineering. Engineering Dean David Wormley, left, and his wife Shirley were honored earlier this year with the David and Shirley Wormley Excellence Fund for the Support of World-Class Engineers. In February, the long-time engineering dean announced his plan to retire from Penn State. According to an email to the college’s faculty and staff by David Hall, a member of the search group and dean of the College of Information Sciences and Technology, the committee has evaluated a large number of applicants and nominations and has developed a short list of candidates who have been recommended to the provost for campus interviews. The Office of the Executive Vice President and Provost will be contacting these candidates to arrange for campus interviews with administrators, faculty, staff and students over the next two months. Wormley continues as dean of engineering as the search for his replacement progresses. He was appointed dean on July 1, 1992. During his tenure, the college’s research expenditures grew from $32 million to $131 million and its endowment increased from $14 million to $173 million. Wormley has a prominent national profile, having served on the National Academy of Engineering Committee on Assessing the Capacity of U.S. Engineering Research. He was chair of both the National Science Foundation Engineering Directorate Advisory Committee and the Executive Committee of the National Research Council Transportation Research Board. He chaired the National Research Council’s Committee for a Study of a Motor Vehicle Rollover Rating System and served as president of the American Society for Engineering Education. 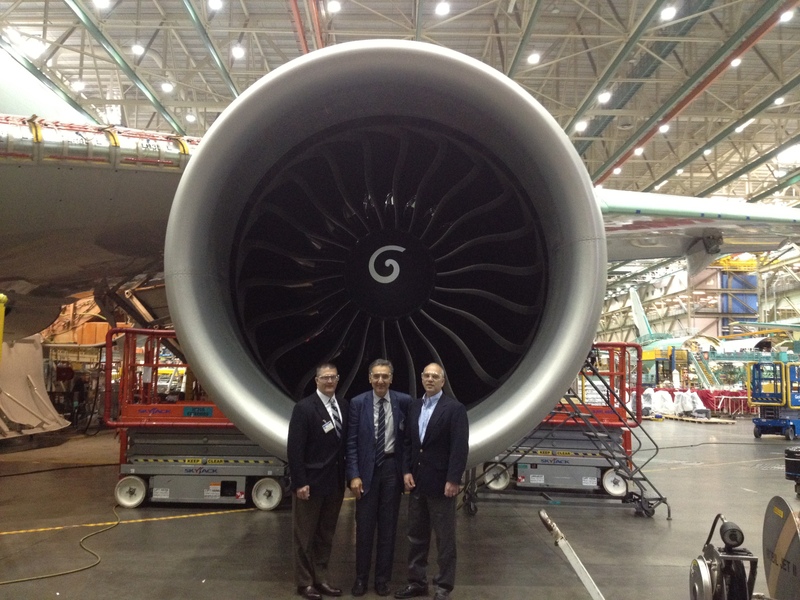 Wormley was elected an honorary member of the American Society of Mechanical Engineers in 2010.